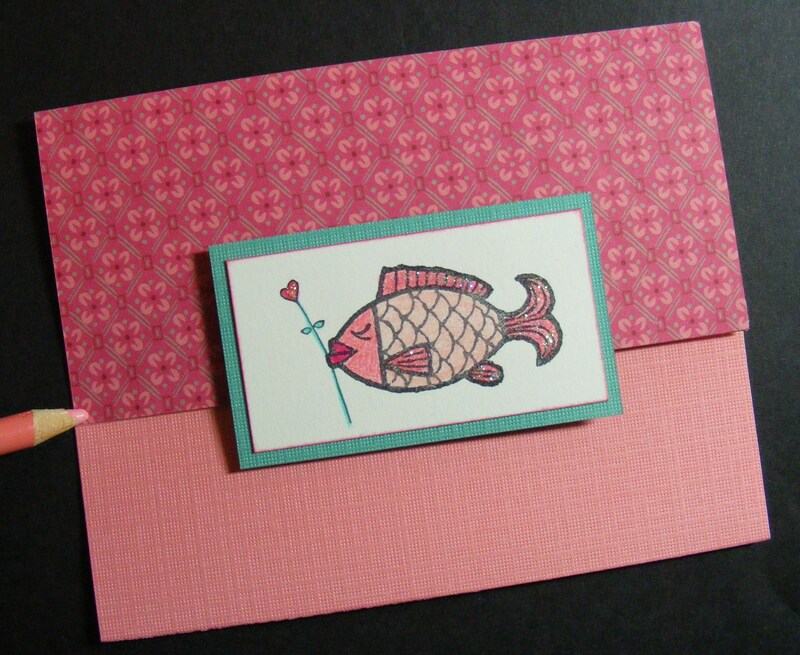 I made this sweet little Valentine’s Day card using the stamp sets “Something’s Fishy” and “Heart-itude” from The Angel Company. I entered in the Red Hearts Challenge at Caardvarks.blogspot.com even though it only has one red heart. I just love the way this card turned out. I stamped the images on white cardstock and colored them with colored pencils. I added cystal Stickles to the fins and heart and mounted them with double stick tape to the aqua colored cardstock. I adhered it to the card front with Pop Dots. What makes this card unique is the unusual fold. It is an 8-1/2 x 5-1/2 inch piece of cardstock. I scored it at 2-1/2 inches from the top and then 1-3/4 inches from the bottom and folded them toward each other. I adhered a 2-1/2 x 5-1/2 piece of patterned cardstock to the top section of the card. This fold still makes a standard 4-1/4 x 5-1/2 inch card. The inside sentiment is the cutest, if I do say so myself. 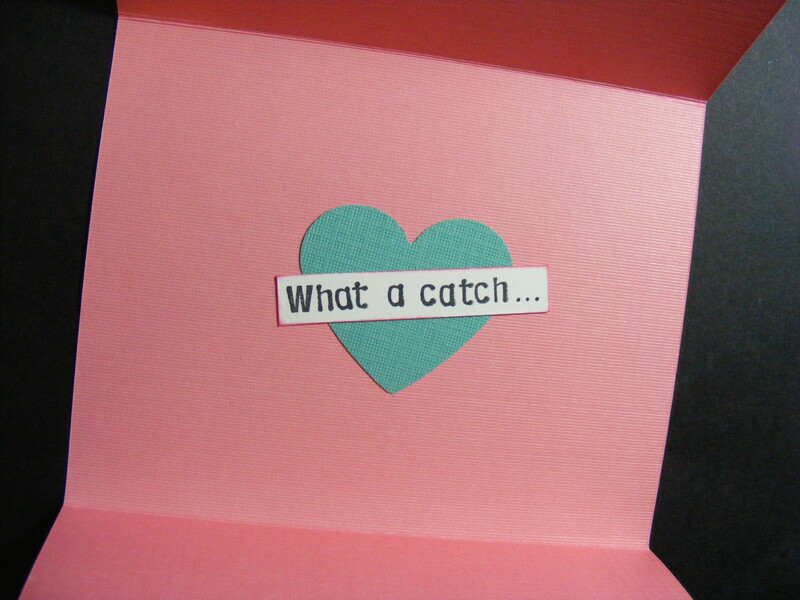 It would make a great card for your perfect “catch”, a boyfriend or husband that likes to fish, or your girlfriend that needs encouragement in the love department. 🙂 The possibilities are endless. If you don’t want to take the time to make this yourself, you can purchase it in my Etsy store. 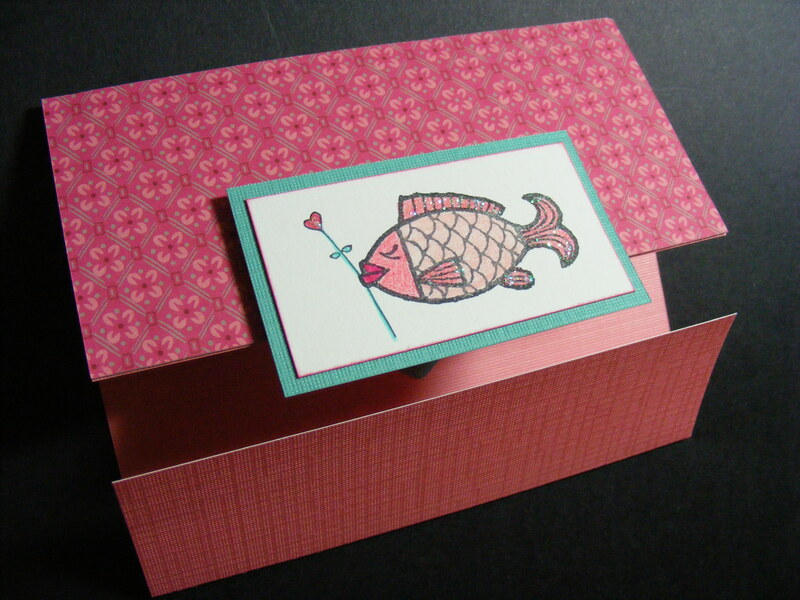 This entry was posted in Cards, Rubber Stamped Items and tagged Card, Fish, flower, Heart, Love, pink, Valentine's Day. Bookmark the permalink.